Digga’s PD25 to PD50 range of drilling auger drives are ideally suited for 20 to 50t excavators with a flow between 70 to 230 lpm. Fitted with Digga / Eaton bell motors with integrated pressure relief valve and input housing. 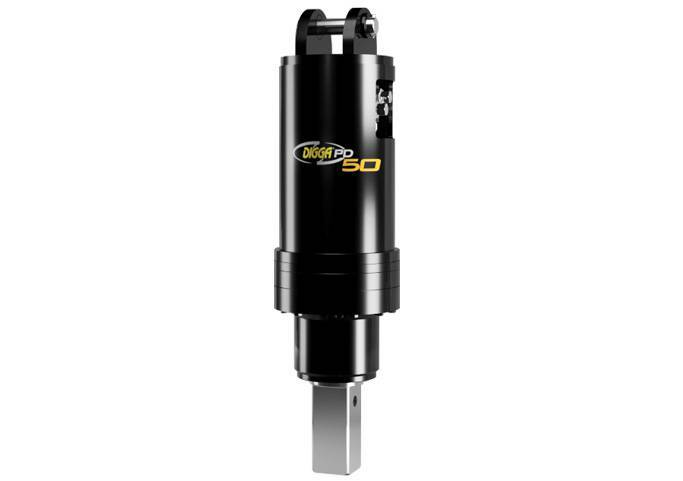 An innovative design allows the gearbox to go down the hole to maximise drilling depth without extensions, eliminating downtime and minimises maintenance, optimising your returns. Digga planetary auger drilling drives are specially designed for drilling and augering in most ground conditions. Digga’s patented Swing Control System dampens the auger drive / auger swing allowing operators to shake dirt off their augers and travelling around sites safer and easier. SCS also greatly improves productivity by making it easier to return the auger into the hole. Eliminates the need for a bulky and expensive valve block. Digga drives are the most compact in the industry. Digga drives can be put down the hole for greater hole depth without voiding the warranty. Isolates the planetary gears from excessive side load. Oversized thrust washer and lock nuts secure the shaft. Easy seal changes and easier servicing. Reduces weight and size of drive. Reduces potential leak points and number of parts. Digga designed the Bell motor in conjunction with Eaton. The Motors are highly reliable and serviceable worldwide. Quality Materials used in production and Digga Controls all facets of production and quality control. Digga stands behind its products with industry leading warranty and after sale service. 5 year gearbox and 3 year motor warranty – Guaranteed. We guarantee our shafts will not fall out – even after continuous use. (*) Max/min drilling diameter (DIA) dependent on ground conditions. Guide is a recommendation only. For pricing or more information about the Excavator: 20T – 50T fill out the form and we&apos;ll be in touch soon. Alternatively call (08) 9457 1544.